Editor's Note: This is the second in a three part series on the Orrville football uniform. Part 1 dealt with the uniform set as it currently exists and can be viewed here. Part 2 will deal with potential changes and tweaks. Part 3 will look at the current helmet and present potential changes in design and colors. 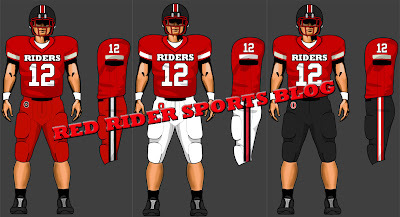 Let us continue with our look at the Red Rider football uniform. 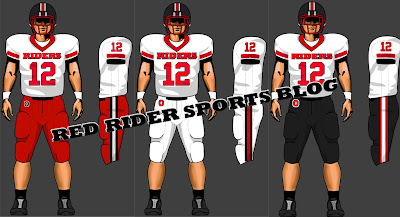 In part 1, I did my best to "digitize" the Red Rider football uniform as it currently stands (Home & Away). This next post will deal with potential changes in both style and color. if you feel good, you play good"
Our current uniforms are simple (a good thing), leaving a lot of room for change, but just because the template is sort of blank, doesn't mean we should cram as much change into it as possible. I do, however, think there is room to make the uniforms more unique and modern without sacrificing our classic look. Here are the changes I'd currently support. Change #1. Add "RIDERS" across the chest of the home jersey. You dont see many teams with lettering across the chest anymore. This would give the jersey somewhat of a throwback feel, like Chris Speilman on the Wheaties box. Here's a another example from Poland Seminary High School. Not sure I'd go for lettering that big, but not much smaller either. PS - I hate that extra white panel on the sides. And while we're at it, I still hate the fact that we lost to Poland in the 1999 playoffs, we had them beat in the 1st half and gave it away. Change #2. Condense the divided triple stripe on the jersey to 2 stripes. Hear me out, I know doing this means that it won't jive with the triple pant stripe, but in keeping a small gap between the 2 stripes, you're still using all 3 school colors, and with the way the colors are used currently, only 1 of our current 4 combinations (red jersey, red pants) will the pant stripes and jersey stripes will match. You'll see what I mean below. I think this would give the jerseys more of a streamlined look. Especially if we start moving to a more "fitted" uniform, a divided triple stripe on the sleeve might look a little cluttered. Change #3. Replace 2 stripe design on black pants with 3 stripe pattern. As I mentioned in part one, this is my major beef with the black pants. Standardizing them with the red pants will make them look so much better. Change #4. Add a Block "O" to hip area of all pants. Very simple change, adds another layer of style without being cluttered. Similar to the Ohio St. Block O. Change #5. Add shoulder or "TV" numbers to all jerseys. Change #6. Add white pants to the uniform set. I went back and forth on this...but ultimately, I think this would be a nice addition, it could be worn with any of our jerseys and I just think a white/white combo is terribly sharp. That's Kettering Alter (current D4 champ) and I think they have one of the sharpest uniforms in the entire state. Also, notice how their sleeve stripe and pants stripe are the exact same? I like that, very consistent. If we're looking for a design to base a uniform redesign on, Alter would be a great place to start. An all white uniform with our classic helmet would look awesome in my opinion. Ok...so adding in all those elements to our uniforms, here's what you get. If we add white pants, we would jump to six potential uniform combinations. Here are potential changes that I'm not 100% behind, but will present for the sake of discussion. Potential Change #1. Add a black jersey to the uniform set. 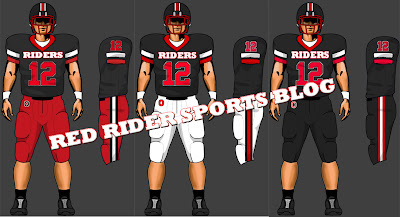 I'm not 100% against this, but adding a black jersey would open up the door to an all black look, and in my opinion, that's not a good look, especially when we are the RED Riders. We've seen black jersey sets creep into the basketball program, boys and girls, and I just have a hard time accepting it. Red is in our school nickname, and neither varsity basketball team has red jerseys anymore (black jerseys were replaced with red in the boys program in 2009). I don't want this to happen to the football team. Here's what a black uniform set would look like, I went with white lettering just to break up the look of the jersey. Red numbers and letters looks a little too dark. See what I mean, something just seems off. Looks too much like Manchester or even Rittman. Just not a fan for a team named the Red Riders. I know adding a black jersey is all the rage in sports uniforms, but I think we should resist black jerseys, I'll accept the pants, although not a fan, but no black jersey. If we added a black jersey we would jump up to 9 different uniform combinations, putting us in Massillon Washington High School Tiger territory. Potential Change #2. Add "ORRVILLE" across the chest of the white jerseys. Just not sure about this one. Here's what it would look like, in both red and black lettering, alongside our current white jersey. If this happened, I'd be in favor of the black lettering instead of the red. I kind of like how it gives the uniform some depth. You'll find a new poll at the top, with the new ideas I've presented. Vote on your favorite. There's an "other" selection if you have an idea of your own that I have not presented. If you vote "other" please expand on your idea in the comments section. Because of the number of suggested ideas, I've allowed the poll to accept multiple answers, so if you like several ideas, you can vote for all of them. The first poll on "Favorite Current Rider Uniform" was pretty evenly spilt. So......what do you think? Part 1 of the uniform series generated the busiest day ever on this site, so I know I'm dealing with a topic people are at least interested in, and if people are interested in something, they normally have an opinion, one way or another. Like what you see? Hate it? Have your own ideas? Discuss it in the comments section. You can register for an account with Blogger, or just post anonymously. The comment section can really take on a life of it's own, but not without your input. This site will never reach it's full potential without input from fellow Red Rider fans. My readers are as much a part of this site as I am, I'm merely the facilitator, the bartender, if you will. In my never ending quest to make the site user friendly, I've added a comment button to try and simplify the comment process, click the button and it will take your to the comment area where you can craft an original thought or respond to another users comment. Lastly, Coach Davault, anyone in the athletic department or Booster Club, if you're even remotely looking into doing something with the football uniforms.....I'd be honored to offer my assistance. You know where to find me. How about a cowboy hat on the hip instead of the "block o"? I think Mo would approve of that addition. I have no idea what that means....those names are familiar to me at all. Care to expand? Where is the link for the "Uniform Poll" or did you take it down? The poll was taken down after a few weeks. It basically asked readers to give their opinion of the different uniforms tweaks/changes i presented. Feel free to use the comments section to express that if you'd like.